Allen, Louis. 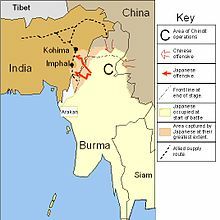 Burma: The longest War. Dent Publishing. 1984. ISBN 0-460-02474-4. Bond, Brian; Tachikawa, Kyoichi. British and Japanese Military Leadership in the Far Eastern War, 1941-1945 Volume 17 of Military History and Policy Series. Routledge. 2004. ISBN 9780714685557. Bayly, Christopher; Harper, Tim. Forgotten Armies: Britain's Asian Empire and the War with Japan. Penguin. 2004. ISBN 0-140-29331-0. Fay, Peter W. The Forgotten Army: India's Armed Struggle for Independence, 1942–1945. Ann Arbor: University of Michigan Press. 1993. ISBN 0-472-08342-2. Franks, Norman. Air Battle of Imphal. London: William Kimber & Co. 1985. ISBN 978-0718305529. Latimer, Jon. Burma: The Forgotten War. London: John Murray. 2004. ISBN 978-0-7195-6576-2. Slim, William. Defeat into Victory. London: Cassell. 1956.